Southeast Asia's Buddhist temples live in two worlds: most of them are simultaneously sacred places of worship and major tourist attractions. Most travelers to the region find themselves in at least one—if not several—during their travels. Governments find themselves in a bind when balancing locals' sensitivities and tourist revenue. And there's plenty of opportunity for offense: worshipers often get up in arms about travelers wearing too little clothing, wearing shoes while climbing a pagoda in Myanmar, and showing off a tattoo of the Buddha. Tourists and Buddhist temples can be a toxic mix. But tourists who follow certain simple, easy-to-remember rules are always welcome in Buddhist temples, usually with a smile even; there is no reason to be intimidated. 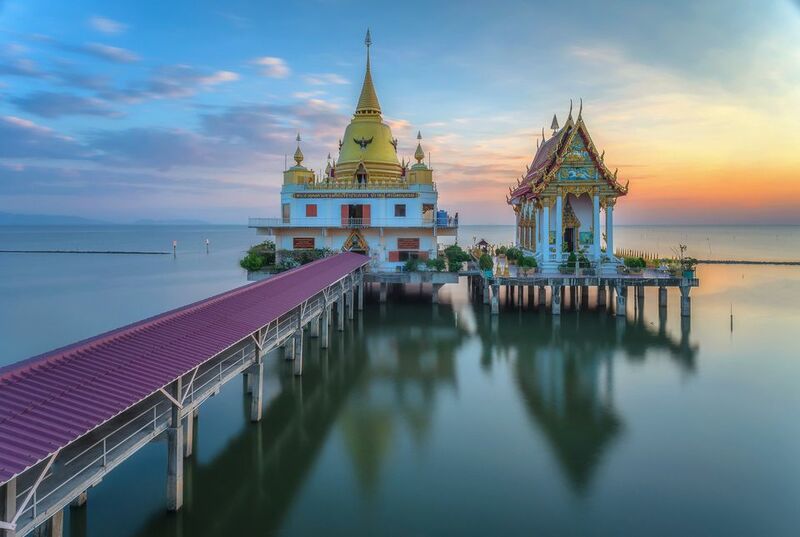 Best behavior: For specific dos and don't's that apply to one of Southeast Asia's Buddhist-majority countries, read up on etiquette for visitors to Thailand, Cambodia, Vietnam, and Myanmar. Full of history, intrigue, impressive architecture and carved reliefs, many temples are wonders to explore. Usually peaceful and hushed, wandering the grounds of a temple while lost in your own thoughts is a memorable experience no matter your religious preference. You'll enjoy the experience even more if you remember the following rules. Show respect: Turn off mobile phones, remove headphones, lower your voice, avoid inappropriate conversation, remove hats, and no smoking or chewing gum. You are likely entering an actual consecrated area, where locals go to commune with the sacred; any hint of irreverence might cause deep offense. Remove your hat and shoes: Shoes should always be removed and left outside of the main worship area. The pile of shoes is an obvious indication of where to leave them. This isn't just good sense; in countries like Myanmar, this is the law. Arrest awaits tourists in Bagan who insist on climbing pagodas with their shoes on, with their tour guides liable to prosecution under the Myanmar Penal Code (specifically Section 295, “injuring or defiling place of worship, with intent to insult the religion of any class”). Cover yourself: This is the rule most ignored by tourists who dress for the heat in countries around Southeast Asia. Shoulders should be covered and long pants should be worn rather than shorts. Some temples in tourist places may be more lenient, but your modesty will be appreciated. Some (not all) temples may provide a sarong or other cover-up for a small fee if the gatekeeper thinks you're not covered up enough. Respect the Buddha Statues: Never touch, sit near, or climb on a Buddha statue or the raised platform. Get permission before taking photographs and never do so during worship. When exiting, back away from the Buddha before turning your back. Don't point: Pointing at things or people around the temple is considered extremely rude. To indicate something, use your right hand with the palm facing upwards. When sitting, never point your feet at a person or image of Buddha. Stand up: If you happen to be sitting in the worship area when monks or nuns enter, stand to show respect; wait until they have finished their prostrations before sitting again. Monks are some of the friendliest people you will meet during your travels. The monks that you see sweeping the temple stairs may be less concerned about dirt and more interested in removing the insects so that no one accidentally steps on one! Eating: Monks do not eat after noon; be mindful about eating or snacking around them. Body language: If a monk is sitting, show respect by sitting before starting a conversation. Avoid sitting higher than a monk if you can help it. Never point your feet at any Buddhist while sitting. Right hand only: Only use your right hand when giving or receiving something from a monk. Advice for women: With apologies to women, gender roles are far more rigid in Southeast Asia's Buddhist cultures. In these parts, women should never touch or hand a monk something. Even if you brush against a monk by accident, they will be uncomfortable, so please exercise caution and be aware of your surroundings. For women participating in the tak bat ceremony in Luang Prabang, they must not make actual contact with the monk when handing over the food or donation. In other contexts, women generally pass on their donations to a man, who then hands it over to the monk. While certainly not expected, these gestures will show that you took the time to research Buddhist customs before your visit. Best foot forward: Enter the shrine with your left foot first, and exit by leading with your right foot. This gesture symbolically represents a whole. The reason wai: The traditional greeting for a monk is to place the hands together in a prayer-like gesture and give a slight bow. Known as the wai in Thailand or the som pas in Cambodia, the hands are held higher than usual (near the forehead) to show more respect to monks. Give freely: Nearly every temple has a small metal box for receiving donations from the public. These donations keep the temple running, usually on a very thin budget. If you enjoyed your visit, giving a small amount would mean a lot. A typical donation is US $1 or less. The best time to visit a Buddhist temple is early in the morning (just after sunrise) when the temperature is still cool and the monks are returning from their alms procession.